Note: I ground up slivered almonds in a coffee grinder. until oil is emulsified. 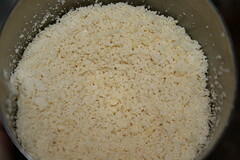 Add liquid ingredients to the dry ingredients and mix together until just blended. and fold into dough until well incorporated. Bake at 400 degrees Fahrenheit for 15 minutes. This recipe will make about 14 scones. Verdict: When I made this recipe, I divided the dough into two halves. Into one half I put the dried cherries, and into the other half I put chocolate chips. Obviously I liked the chocolate-chip scones -- how could I not? 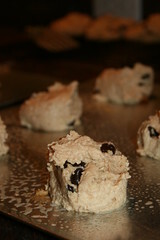 The cherry scones were a little bland to me -- I was hoping the almonds would give it more of an almond taste, but alas. It didn't occur to me until afterward that I should have added a teaspoon or so of almond extract to the mix. Duh! I think the scones would have benefited from the addition of almond extract, and I highly recommend that you give that a try. 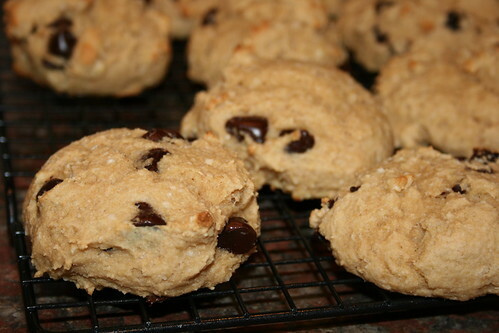 All in all, though, I think this recipe provides a good starting point for a fancier scone recipe. You can dress it up with all kinds of flavor combinations.